The results are in! (Well, at least the preliminary results). 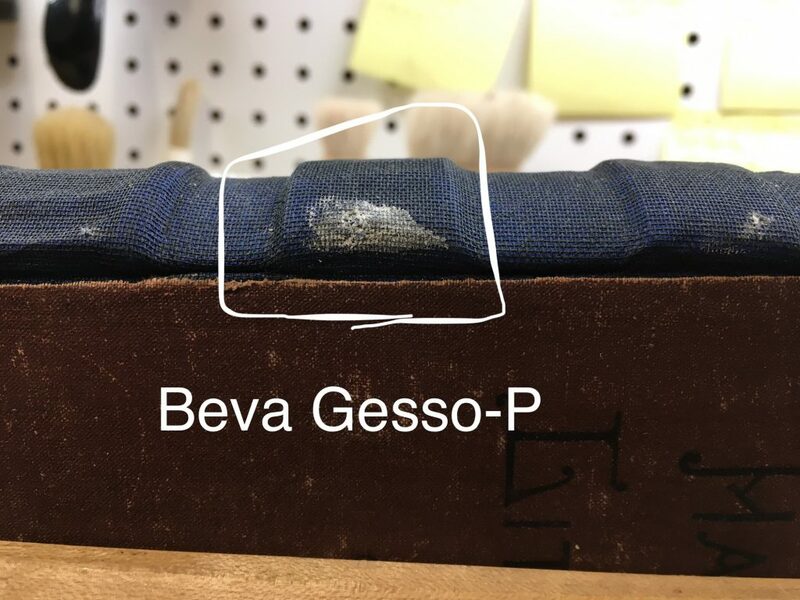 I spoke to the people at Talas who told me they had no product for my intended use (filling in a loss on a book spine, under deteriorated leather that I can’t lift). 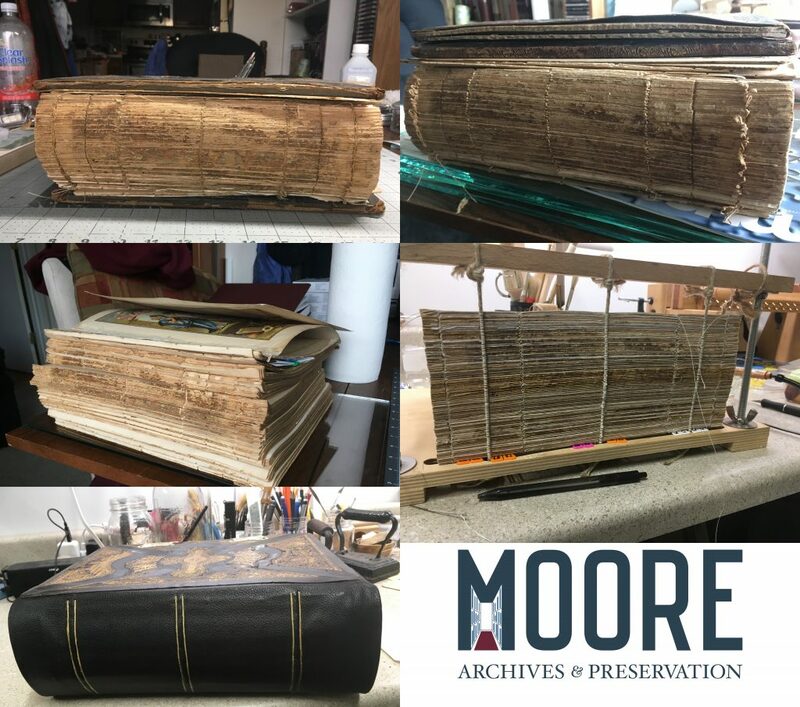 The day I posted last, I took a book from my Library of broken books and fixed it up, attaching mull and false raised bands onto the spine with wheat starch paste (WSP), attached the original boards, inserted new endpapers, and covered the spine with some book cloth. 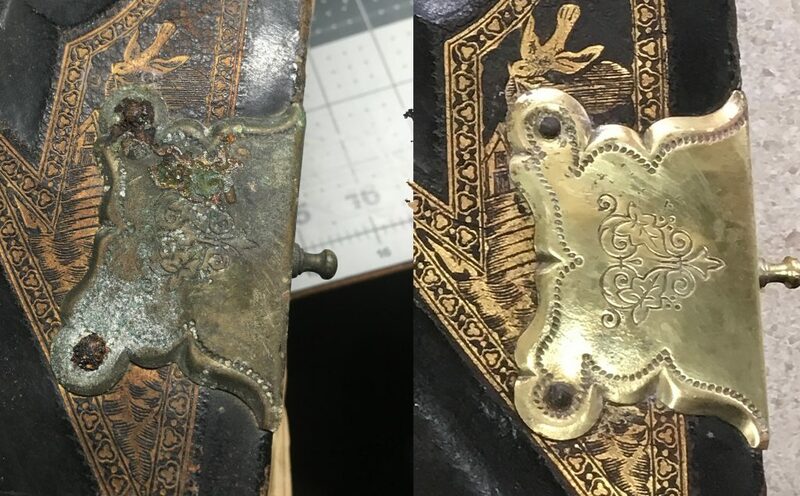 I thought about using leather similar to the one on my client’s book, but I don’t have any old deteriorated leather that turns black and brittle with moisture just sitting around to cover spines with. I chose book cloth because this at least gives a visual indication of moisture. With that in mind (last week), I bought glass micro-balloons, Beva Gesso-P fine texture, and Flügger Acrylspartel (acrylic putty). 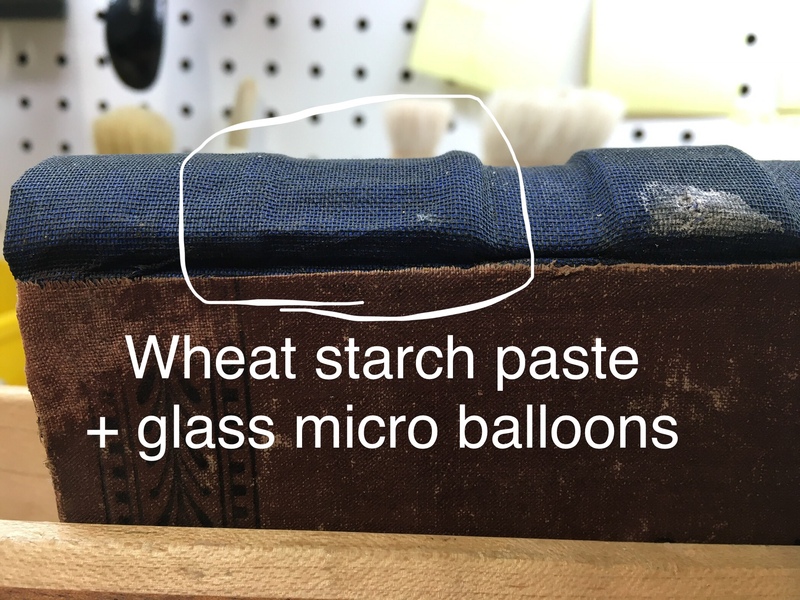 Yesterday I mixed the glass balloons with wheat starch paste, and used a hypodermic needle to inject it into the loss I fabricated. 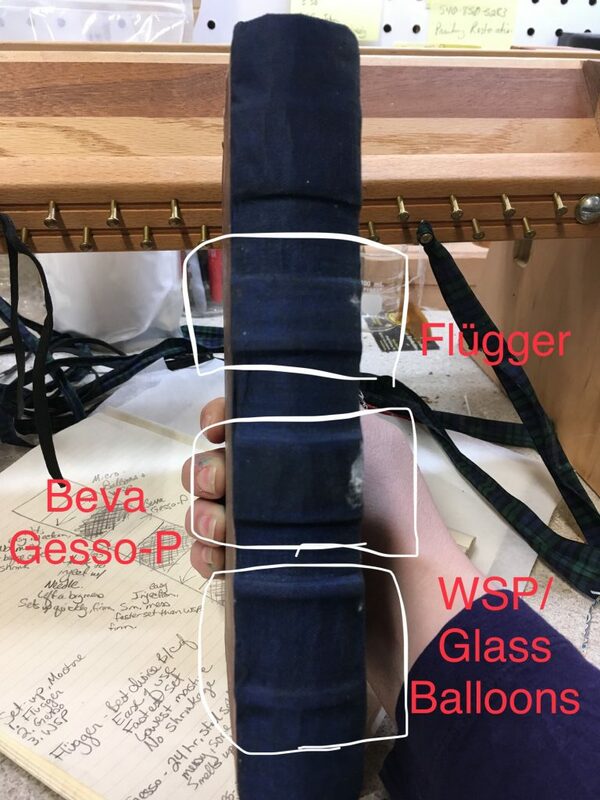 The WSP displayed the highest moisture content, and was the runniest substance. After 24 hours, it had set, with noticeable shrinkage and significant slump. It was easy to inject with a hypo, and the softest substance I worked with. The next test was the Gesso. I chose this product primarily because of its description, low moisture, and known (conservation) stability with wood and wood products. 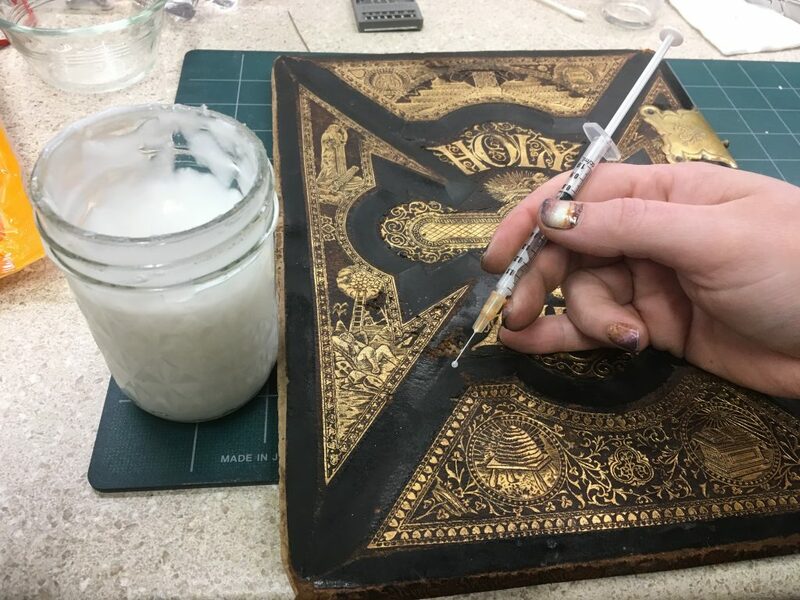 The mineral powder suspended in the paste predictably didn’t like being worked through a hypodermic needle- I was forced to remove the needle and enlarge the injection site by cutting a small slit into the book cloth, and injecting it there. The delivery worked okay, but the results were very messy, and is proving very challenging to get out of uncoated book cloth. 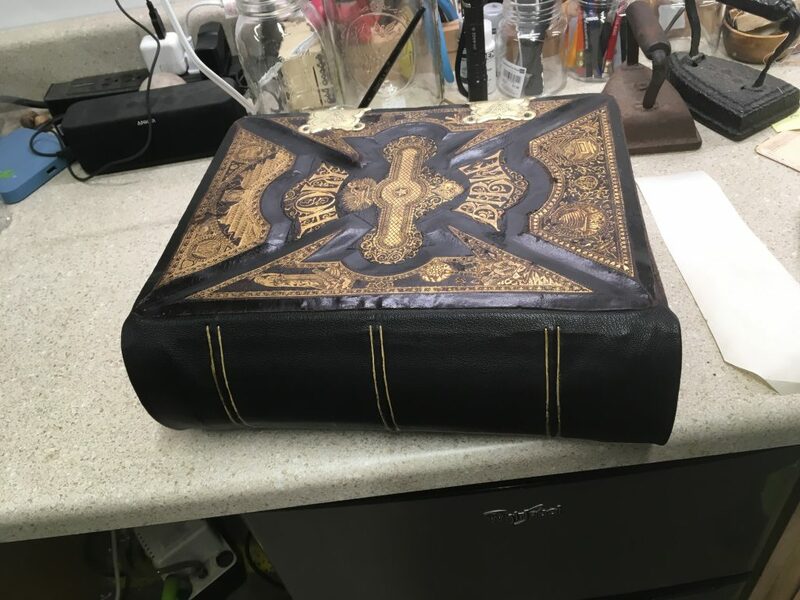 It has been in place for 24 hours, and is still soft and malleable under the book cloth, and though it is still setting up, there is some minor shrinkage so far. Upon injection, the book cloth turned dark, and this hadn’t faded over the intervening time. Inspection of the inside of the book revealed that it smelled strongly of Gesso, but nothing had leaked within. 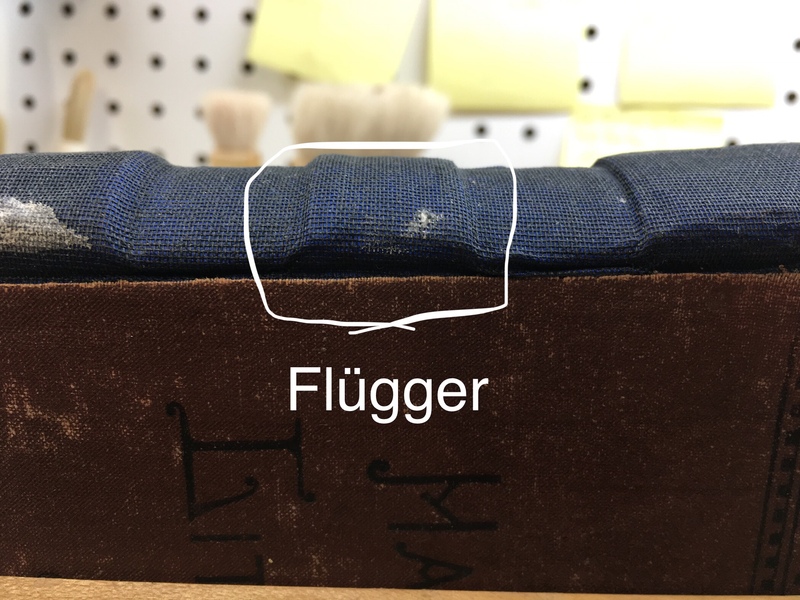 The last product I tested was Flügger. Though I had to fill the hypo without the needle, injection was done with the needle quite easily and with little mess. Flügger displayed the least amount of moisture, fastest setting, with zero slump and unnoticeable shrinkage. I think, once it’s dry I will cut the spine off and take a look at how the fillers interacted/soaked into/settled in place, and make my final decision on what I’ll use. As of now I’m leaning towards Flügger. I’ve found this report mentioning that Polycell Fine Surface Polyfilla was a superior product, so I’ve ordered some of that online (not easy to find here in the states, surprisingly). When it arrives, I’ll see about putting it in the last loss in my testing spine, and we can compare. This is a client’s piece, only recently discovered after languishing decades in a trunk in the attic. 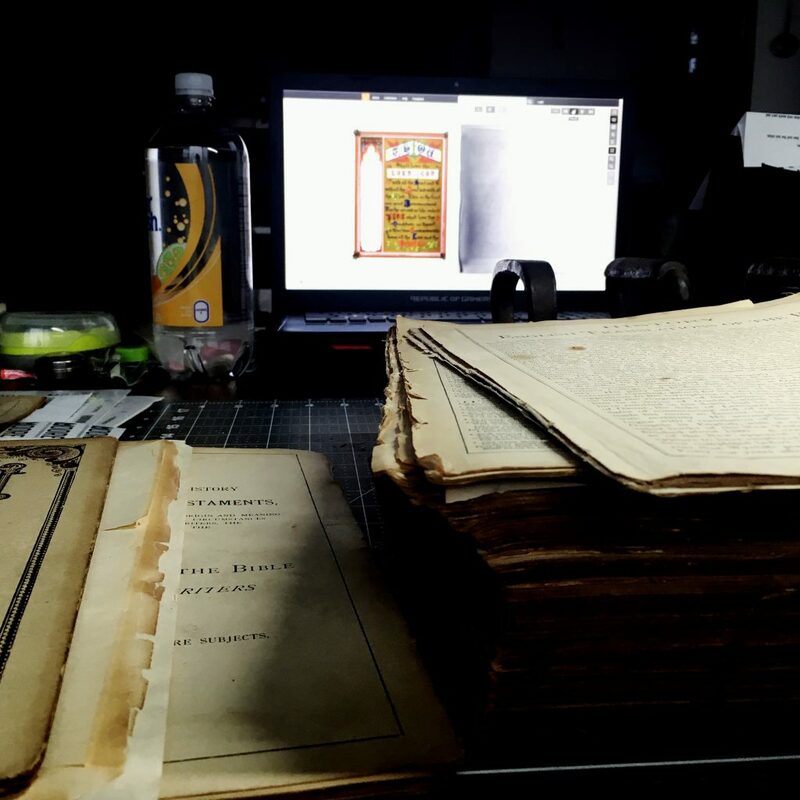 Working with the client, we agreed on rebinding the book, limited conservation intervention, and as much repair as I could manage. The clasps were missing from the back, but they remained on front cover. The iron nails holding them in place had rusted and the corrosion damaged some of the brass. 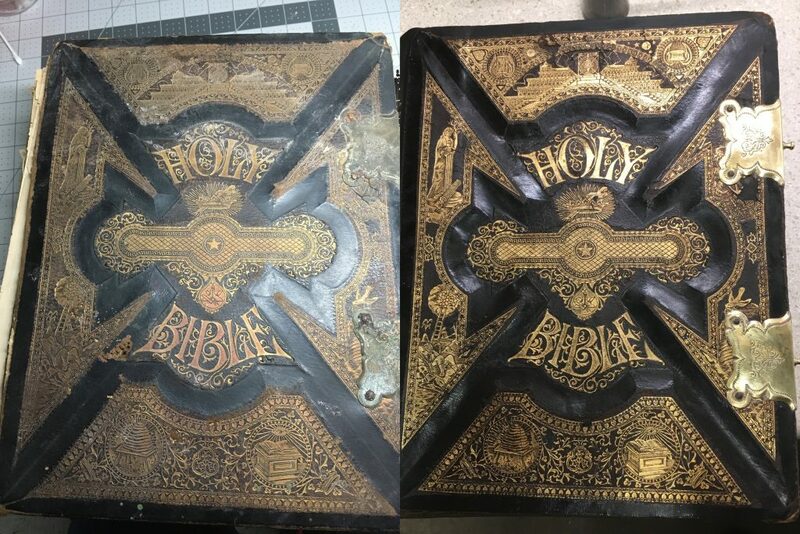 The gilding was really dirty, and was the primary reason why I had the bible in my possession for so long. It took months of trial and error to find a cleaning method that didn’t lift the gold. 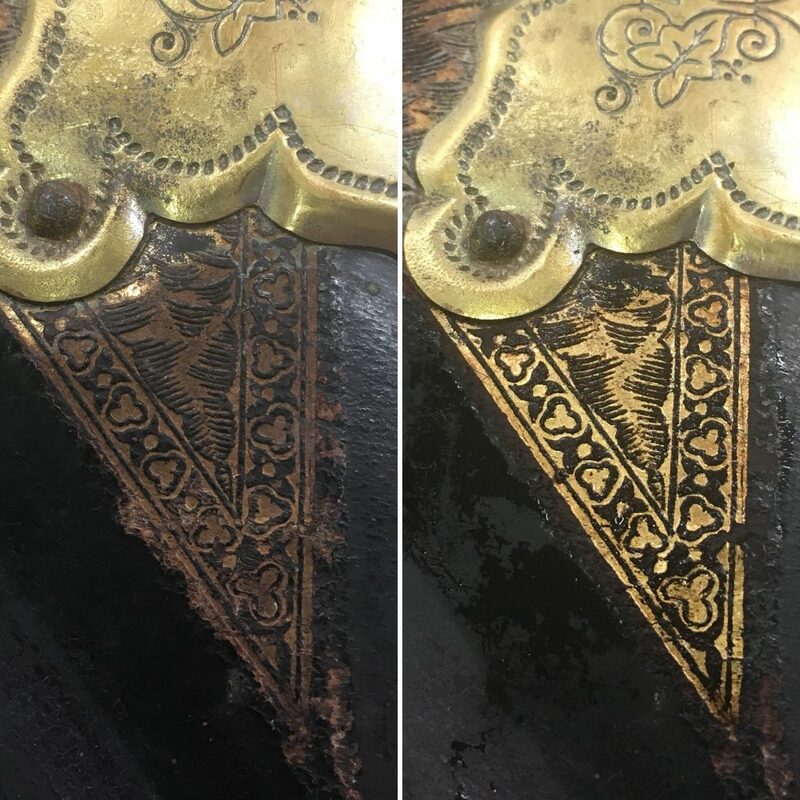 Some kind of protective cover had been applied to the gold and had gotten dirty and trapped 119 years of grime in place. I tried (in order): water, isopropyl alcohol, leather detergent, soap and water, metal de-corroder, and Brasso; none of which were successful. I consulted a professional gilding studio with over 40 years experience working with gold gilding, and they were stumped, because gold shouldn’t tarnish! I’d already tried all of their suggested fixes, and spent months trying to research a solution- all to no avail. Vulpex is a soap I use when washing paper- I never considered trying to clean gilding with it, as it is pretty intense stuff, able to clean grease and dirt from paper without any agitation or physical interaction. I had the cleaning agent in my cupboard the entire time! I ended up using a 20% solution and finally seeing what the lovely gold was supposed to look like! 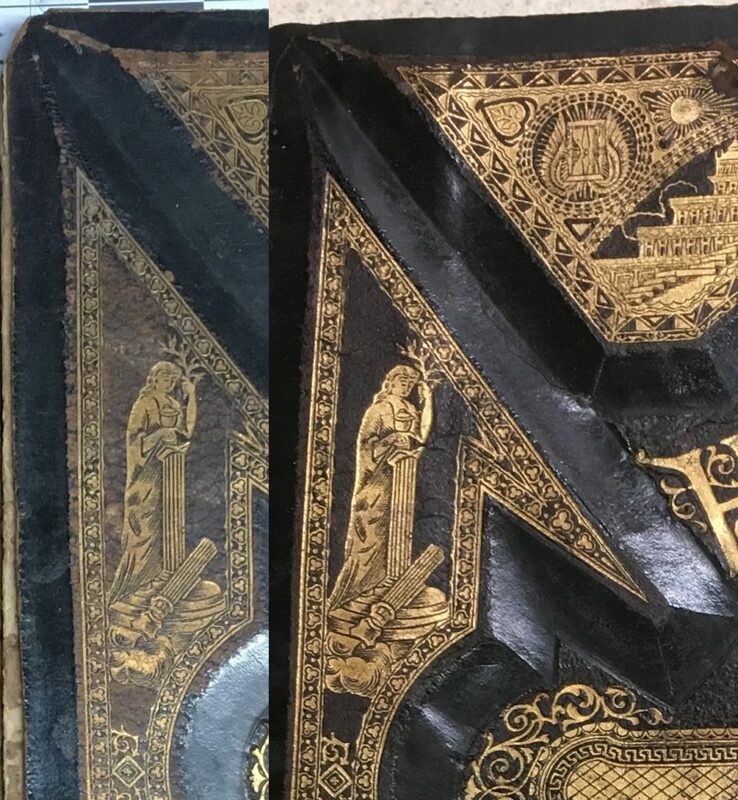 The leather on the covers had been quite worn, and where it rubbed against other books or shelves, the leather dye had been worn away/faded. To fix this, I mixed up a solution of watered-down black watercolor paint, and put a few coats over both front and back, darkening the leather. 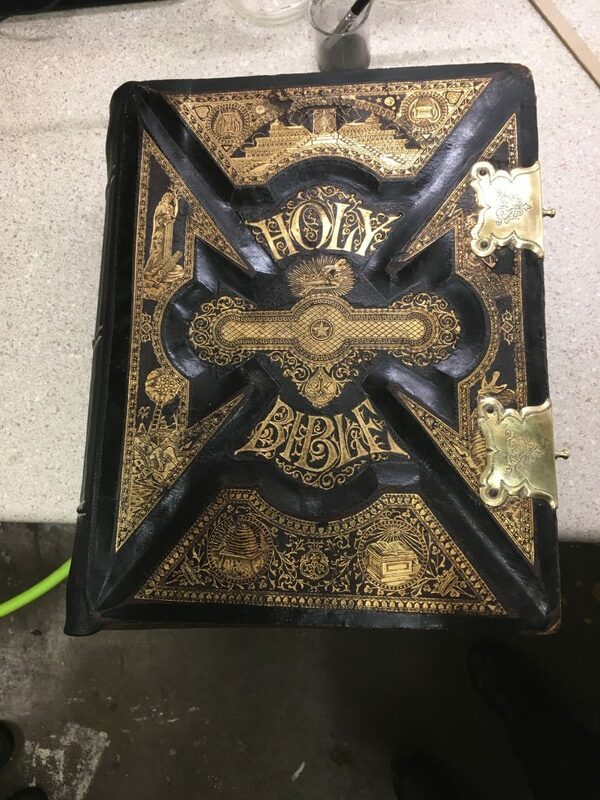 I didn’t want to use 100% opaque black, because we didn’t want the bible to look completely new; the watered down solution darkened the leather enough to give the design the dramatic contrast it was meant to have, but not completely darkening the leather. The bible came to me in pieces, and with no spine. I completely re-bound the book by hand, trimming up the edges, cleaning, and mending all the tears and filling in gaps. 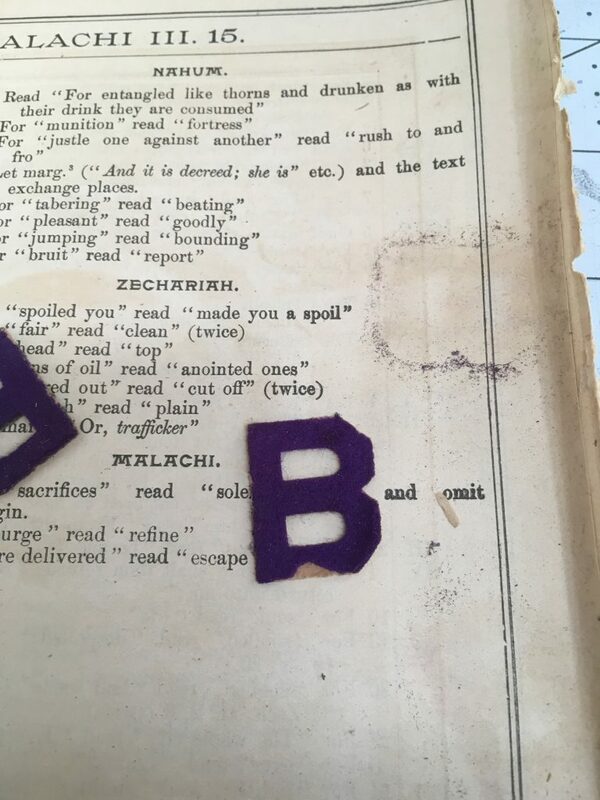 This paper was (and mostly still is) highly acidic, which has caused the worst damage to the edges of the paper. 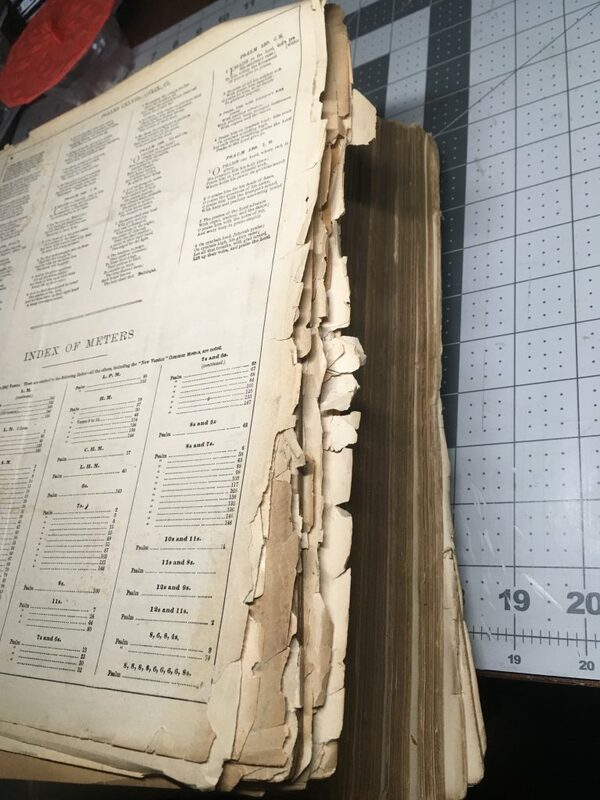 The client and I worked to find a good solution on the conservation work to fit their budget, and so I only deacidified the pages that contained handwritten data. The rest of the book remains subject to further deterioration, but I trimmed the edges and reinforced weak points with acid free asian papers, to help the bible last as long as possible. I neglected to get an after photo though! The paper in the beginning and end of the bible had completely come unbound and had been mixed together. Unfortunately the printers who put the book together didn’t seem to have the process figured out, because each new section (index, Animals of the Bible, etc.) started with page number one- so putting it back in order was particularly challenging, especially the sections that were missing a page or two. I did some research and found a completely digitized version of this bible, and was able to reassemble the book thanks to this reference! In old books, and especially in large books a binder finds many interesting things; hair, bugs, dirt, seeds, death certificates, old greeting cards, and… Bees? Oh, Bs. It was especially funny to run across these in the binding! Purple bees and their pollen. This is the hand-binding section. Up to this point in my career, this is the largest book I’ve ever had to re-bind by hand. 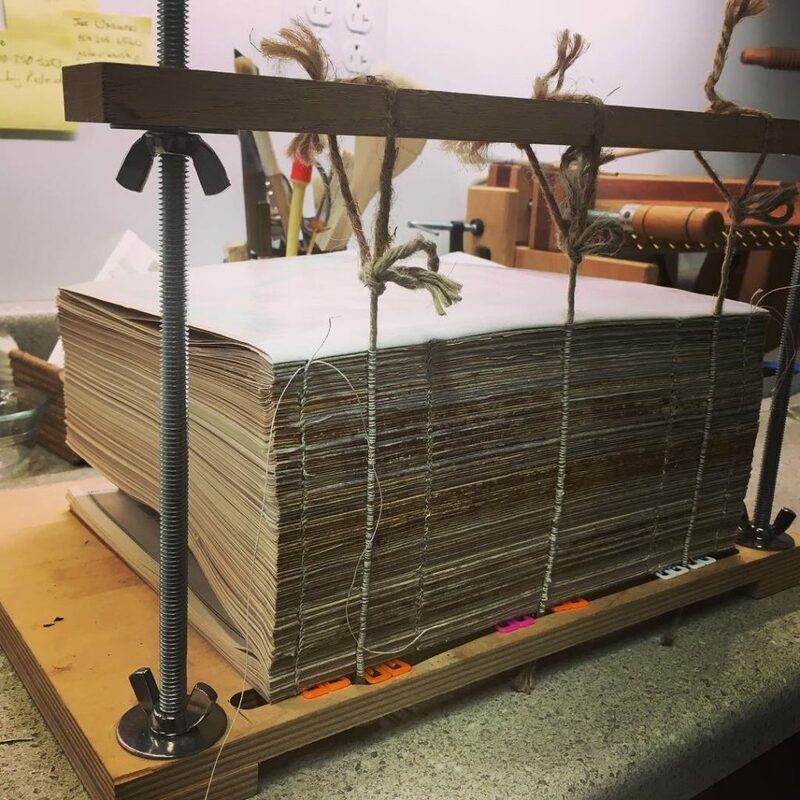 I think the total amount of time sewing each signature into the book totaled approximately four full days of labor, and this book’s spine was over nine inches wide. 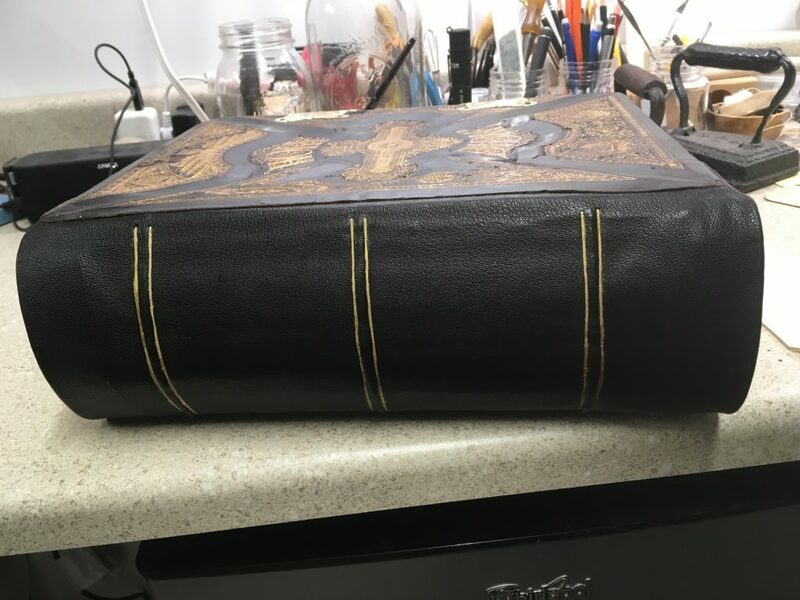 Sadly, the leather had really taken a beating over the years, and had come unglued from the formed cardboard cover- but hadn’t come completely unglued. 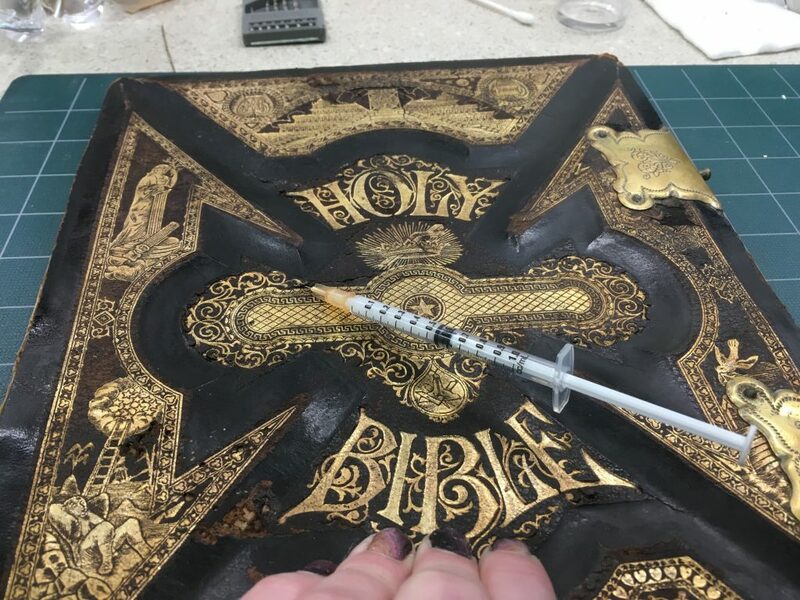 Only certain parts had come unglued, and I had to come up with a good solution for delivering the glue to the right place, without pulling the whole cover off and risking further damage to the leather. I sent out a query to friends and family, asking how I might get some hypodermic needles- to some predictably wary responses! Thankfully, several friends stepped forward to donate old pet medication needles and unneeded insulin needles to a good cause. This ended up being the best solution to deliver adhesive to the hard-to-reach places. And here is the finished product! I learned so much from this project, and it was extremely satisfying to bring to completion. My client is happy; I am happy; this book will last many more years to chronicle the life of its family.